In this week’s feature article, we consider the effect of a High Court judgment, handed down last Thursday, on breach of duty in noise-induced hearing loss (NIHL) claims. This case tested the significance of a claimant’s allegation that, in order to ‘communicate he had to shout or use hand signals’, where there were no noise surveys to corroborate or refute a consultant engineer’s noise level/dosage calculations. The case concerned a NIHL claim, commenced by a 72-year-old claimant against a former defendant employer (D1), at a factory operated by the 2nd defendant (D2). In his pleadings, he alleged that he was exposed to injurious noise levels in the course of his employment. The claimant was employed by D1 as an apprentice electrician, between 1963 and 1968, at D2’s factory. He subsequently worked for another employer, between 1968 and 1976, also in D2’s factory. He attended work 7 days per week (6 when he was an apprentice), labouring 10 hour shifts (though this was deemed to be an exaggeration). The cutting of aluminium ingots. The claimant’s job involved the installation, maintenance and repair of operating machinery. His witness statement purported that he would ‘never work more than a few feet’ from machinery which sometimes had to be switched on to find a fault. Jobs supposedly varied in length, from ‘minutes’ to ‘days’. What is more, he pleaded that no hearing protection was provided and that he was not warned about the dangers of exposure to excessive noise. ‘... it was necessary to shout to communicate with my colleagues at very close distances or even resort to having to tap them on the shoulder in order to get their attention or lip read what it is they were trying to relay to me’. The judge at 1st instance established that the claimant’s ‘date of knowledge’ was summer 2012, meaning that the claim was issued within the 3-year limitation period for personal injuries. q) Failed to monitor the noise levels at the said premise[s] properly, sufficiently, frequently or at all to ensure the Claimant was not exposed to unsafe levels of noise’. In response, the defendant made no admission on liability and put the claimant to strict proof. Mr Kevin Worthington was jointly instructed to produce expert engineering evidence. D2 adduced no evidence at trial that noise surveys of D2’s factory had, or had not been conducted, in the course of the claimant’s employment. As a result, Mr Worthington was unable to refer to noise surveys when calculating the claimant’s noise exposure. However, in similar aluminium production plants, Sound Research Laboratories Limited, in 1989, recorded varying machinery noise levels, from 80 dB(A) Leq to 106 dB(A) Leq. These readings decreased to between 75 dB(A) Leq and 88 dB(A) Leq when the machines were shut down. On the basis of this information, albeit of ‘limited assistance’, Mr Worthington found that, although there were some areas of D2’s plant where the noise levels were likely to exceed 90 dB(A), the average level was would be unlikely regularly to exceed this. ‘Hence, without observation of contemporaneous noise surveys/measurements from the premises at which the Claimant worked, it is not possible to demonstrate, on the balance of probability, that his average daily noise exposure level would have reached or exceeded 90dB(A) during [this] period of employment. Hence substantiation of this claim on engineering grounds would be very difficult’. Further, relying on guidance and assumptions alone, Mr Worthington suggested that the claimant’s NIL did not exceed 97 dB, between 1963 and 1968, and did not exceed 99 dB, between 1968 and 1976. ‘At the time of the Claimant's employment those duties included a duty to monitor the level of noise at the factory in order to determine whether and if so, what steps needed to be taken to protect the Claimant from exposure to noise which might damage his hearing’. Counsel for the claimant also argued that, since D2 had failed to disclose noise surveys, it was ‘to be inferred that none was carried out’. ‘There is no evidence that the defendants took any measurements of noise levels in their ships and the judge's finding is that they did not’. ‘... in the present case there is the potent additional consideration that any difficulty of proof for the claimant has been caused by the defendant's breach of duty in failing to take any measurements. The judge does not appear to have given any weight to this important factor. If it is a defendant's duty to measure noise levels in places where his employees work and he does not do so, it hardly lies in his mouth to assert that the noise levels were not in fact excessive. In such circumstances the court should judge a claimant's evidence benevolently and the defendant’s evidence critically. … [A] defendant who has, in breach of duty, made it difficult or impossible for a claimant to adduce relevant evidence must run the risk of adverse factual findings. To my mind this is just such a case’. By contrast, defendant counsel sought to distinguish Keefe on the facts, on the basis that the present case was ‘concerned with events 50 years ago’ and, unlike in Keefe, where the judge was able to make a finding that no noise surveys had been conducted, it was impossible to make the same assumption with certainty in the present case. The fact that documents created 50 years prior might not be available was hardly ‘unsurprising’. On 15 November 2017, His Honour Judge Vosper dismissed the claimant’s NIHL claim against both defendants. ‘... it is not possible to make a finding that [the Respondent] is in breach of duty in failing to carry out noise surveys’. ... the Claimant's evidence could not be regarded as sufficiently precise for me to reject the engineering evidence in favour of it. That is not to criticise the Claimant. It is simply unrealistic for him to be able to remember in detail the events of more than 50 years ago. ‘I do not accept the submission of Mr Johnson that I should ignore the engineering evidence because the Second Defendant has not produced noise surveys’. Accepting the evidence of the single joint engineer, the claimant was judged to have failed to prove tortious exposure to noise by the defendants. Subsequently, the claimant appealed against HHJ Vosper’s ruling, in respect of D2. HHJ Vosper should not have distinguished the case from Keefe. On ‘benevolent’ interpretation of the claimant and ‘critical’ interpretation of the defendant, per Longmore LJ in Keefe, D2 tortiously exposed the claimant to excessive noise between tax years 1963/64 and 1975/76. HHJ Vosper did not consider that D2’s duty to peripatetic workers, post-1972, was to avoid any exposure at or exceeding 90 dB(A). In the alternative, that HHJ Vosper did not accept that D2’s duty to peripatetic workers, post-1972, was to avoid any exposure at or exceeding 90 dB(A). By contrast, the defendant contended that HHJ Vosper’s judgment was ‘careful and considered’. 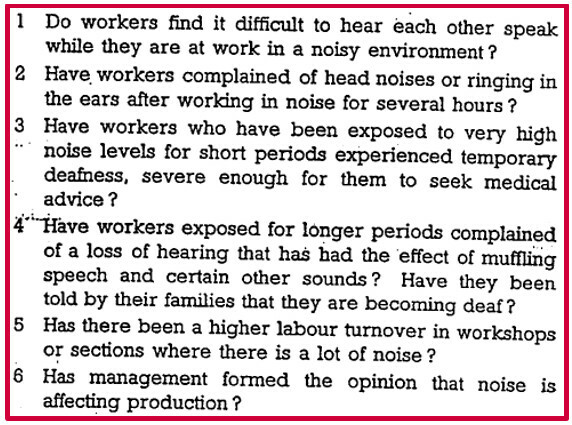 Then, in 1968, Noise and the Worker was revised to state that ‘excessive noise’ could be identified by the existence of just 1 factor. Thus, the claimant averred that from 1968, the duty to conduct noise testing applied to D2. Was there a duty to carry out a noise survey? And if so, when did this duty arise? On this preliminary issue, encompassing the 1st ground of appeal, Mr Justice Garnham considered that ‘it could not be said there was a duty to conduct noise surveys at the second defendants' premises before 1968 but there was such a duty after 1972’, when the Code of Practice was published. ‘... prior to 1972, a reasonable and prudent employer ... may have been unaware as to how to conduct a detailed assessment where they could engage the services of a specialist consultant’. ‘Plainly, the duty to consider conducting a noise survey did not arise instantly upon publication of the 1968 edition. Had the defendants applied their minds to the issue ... they ought to have ... sought to obtain specialist advice. That advice, in all probability, would have included the need to conduct a noise survey. Before concluding that there was an operative duty on the defendants to conduct such a survey, however, some allowance has to be made for the time it would take for a reasonably prudent employer to appreciate the effect of the 1968 edition, to identify appropriate specialist advice, to commission that advice and to receive and act upon the resulting report. In Baker v Quantum Clothing, a period of two years was recognised as reasonable for such a process. I see no grounds for a judge taking a different approach and, in those circumstances, I would hold that the Judge ought to have concluded that the defendant was under a duty to conduct noise surveys from 1970’. What was the consequence of D2’s breach, post-1970? On assessment of this supplementary issue, covering grounds 2 and 3 of appeal, it was necessary for the judge to consider the effect of the defendant’s breach, in the context of Keefe. Ultimately, Garnham J determined that the 1st instance judge was wrong to distinguish Keefe, on the facts. He went further, stating that in rejecting the application of Keefe, HHJ Vosper had not afforded ‘the claimant's evidence the beneficial [benevolent] interpretation which Keefe called for’, which would inevitably ‘concluded that the likelihood was that the claimant was exposed to tortiously high levels of noise’. What of grounds 4 and 5? In a sparse section of the tail-end of the judgment, Garnham J considered the claimant’s 4th ground of appeal, which was not addressed at all in the 1st instance judgment. Counsel for the defendant supported HHJ Vosper’s approach, which was seemingly to ignore the issue. Mr Worthington’s engineering evidence established that it was unlikely the claimant was exposed to noise above 90 dB(A). It was obvious, therefore, that a peripatetic worker would not have been exposed to a noise dose in excess of 90 dB(A) Lep,d. Whether or not the Code of Practice prohibited exposure above 90 dB(A) was a non-issue. However, for reasons that are not clear, nor explained, the judge preferred the claimant’s argument, finding that ‘it was incumbent on the Judge to explain why he was rejecting the claimant's arguments or why he preferred the defendants’. In light of all of the evidence and party submissions, the judge found in favour of the claimant on grounds 1, 2, 3 and 4 of the appeal and remitted the case to the County Court for assessment of damages. Since judgment was handed down last week, we have received confirmation from Patrick Limb QC, of Ropewalk Chambers, that their client (D2) intends to seek permission to appeal the High Court ruling. Once the appeal paperwork is drafted, we look forward to seeing the grounds of appeal which would be deliberated at the Court of Appeal. In the interim, it is important to analyse the quality and the relevance of the High Court decision. ‘As there was evidence that there were communication difficulties in the workplace [difficultly hear each other speak] then from 1970 there was a duty to carry out noise surveys. Failure to do so was breach of duty’. 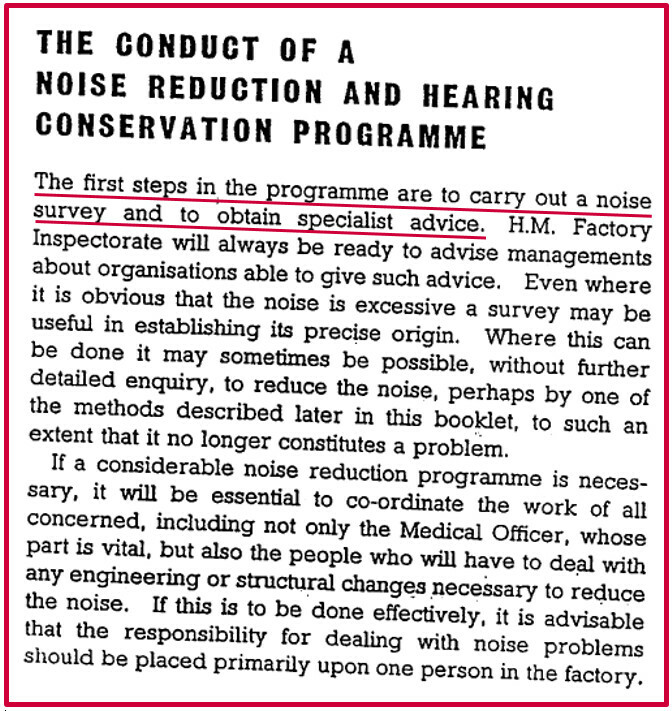 From 1970, the only guidance available was the Ministry of Labour publication, Noise and the Worker (1963) and the Department of Employment publication, The Code of Practice (1972). Both of these documents were non-binding and both sought to achieve an aim; namely that long-term exposure to noise, which would equate to a damaging overall quota of noise, should be avoided. If judges translate this guidance as being equivalent to the binding Noise At Work Regulations (1989), this raises a potential issue – which parts of the pre-1989 guidance is binding? The reality is that, in most cases, a claimant’s historic recollection of communication interference will be the only available witness evidence. In this scenario, even though noise levels were likely to be well below the threshold of action, the defendant was effectively rendered in ‘automatic’ breach of duty, UNLESS they were able to produce evidence of noise surveys. The decision had the effect of reversing the burden of proof from the claimant (proving excessive noise exposure) to the defendant (proving under-excessive noise exposure). ‘In some cases where there are no direct surveys of the Claimant’s workplace reference has to be made to other surveys, and there is a degree of the application of judgment based on the expert’s experience in arriving at at least a bracket of likely exposure. Reconstructing noise levels is not a precise science. ... I do not think that the decision on noise levels at any of these factories, given the scientific evidence that there is, can in these cases be affected by the lay witness evidence referred to above. I do not think it appropriate to take a level or bracket coming from the engineering evidence, and adding to it because of the description given by witnesses’. Before inspecting why Garnham J overturned HHJ Vosper’s distinction of Keefe in the present case, we should consider how the courts have previously distinguished Keefe. In Heavey v TMD Friction Ltd (Wakefield County Court, October 2012), the Court was convinced, without hesitation, that it cannot be safely and properly inferred, 30 years after the event, that the historic absence and inability to locate evidence of testing is proof that no testing was undertaken. In his judgment, HHJ Cockroft referred to Keefe as being ‘almost the exact converse of the present case’, as noise levels were ‘routinely measured’. Like Mackenzie, there had been no admission of a failure to measure noise levels. Similarly, in Caines v Sandbanks Yachting Ltd & 2 Ors (Southampton County Court), HHJ Burrell QC found that Keefe ‘had no application to the facts of the case’. Here, the alleged noise exposure took place in the early 1970’s and the only evidence that the defendant could adduce was ‘snapshot’ photographs of machinery on a large site, where noise exposure could vary enormously. Here, the 1989 Regulations did not apply, whereas they did in Keefe. Unlike in Keefe, there was no positive evidence to suggest that noise surveys had not been carried out. It was foreseeable that documents could have been lost, due to a longer passage of time than in Keefe. Here, there was expert engineering evidence, whereas in Keefe, there was none. The judge on appeal did not consider that any of these distinctions constituted ‘good grounds’ to depart from Keefe. His rejection of the defendant’s 1st argument was based on the existing duty to carry out surveys, expressed in guidance published before 1989. We reiterate that Noise and the Worker was never intended to have binding effect and nor was the Code of Practice. His rejection of the defendant’s 2nd argument was based on the claimant not having seen surveys. However, it is surely reasonable to think that you cannot imply documents into existence just because they are not found. His rejection of the defendant’s 3rd argument was based on his own expectation that some documents would exist. This is a staggering prospect, given that the most recent exposure occurred some 42 years earlier. Finally, his rejection of the defendant’s 4th argument was based on the engineering evidence, which provided no ‘positive evidence’ on noise levels. This appears, from the judgment alone, to be incorrect. Mr Worthington concluded that it was unlikely that the Claimant was regularly exposed to noise above 90 dB(A) – a positive finding if ever there was one. ‘It makes clear that, when a defendant is under a duty to measure levels of a toxin (such as noise, or dust), they must provide those measurements, or explain why they cannot do so, otherwise a claimant may establish breach even in the absence of supportive expert evidence’. But, to what extent is this acclamation genuine? Mackenzie is an appeal from a Circuit judge and is therefore binding on the Circuit bench, in theory. However, Keefe, a Court of Appeal decision, has a higher standing than Mackenzie, which means that defendants are still open to argue, as they have in previous case law (see above), that Keefe does not apply on the facts of subsequent cases heard in court. The most apt description of Mackenzie, therefore, is that it is an application of Keefe on a specific set of facts. When faced with a different set of facts, one might expect that a judge would reach an alternative outcome. What if Mackenzie was followed, hypothetically? One might envisage, if Mackenzie was unsuccessfully appealed at the Court of Appeal and had equal standing with Keefe, that it could not reasonably be followed in a number of circumstances. For example, to apply Mackenzie in a NIHL case involving a dissolved entity, it would surely be an oversight to punish a defendant of this status from providing documents that are no longer available. What is more, in the context of asbestos case law, Doughty Street’s interpretation of the Mackenzie judgment would appear to suggest that from 1970 onwards, thanks to the introduction of the 1969 Asbestos Regulations, a defendant’s failure to adduce asbestos testing evidence would result in an ‘automatic’ finding on breach. ‘The case is unlike Keefe v The Isle of Man Steam Packet Co Ltd  EWCA 683 (Civ), in which the Court of Appeal held that the defendant could not assert that it had not been proved that the noise levels on its boats were excessive when in breach of duty it had failed to measure those levels. There was no duty on the company in 1978 to check the lagging for asbestos, only guidance, and it was sufficient compliance with that guidance for the company to proceed on the assumption that it contained crocidolite’. 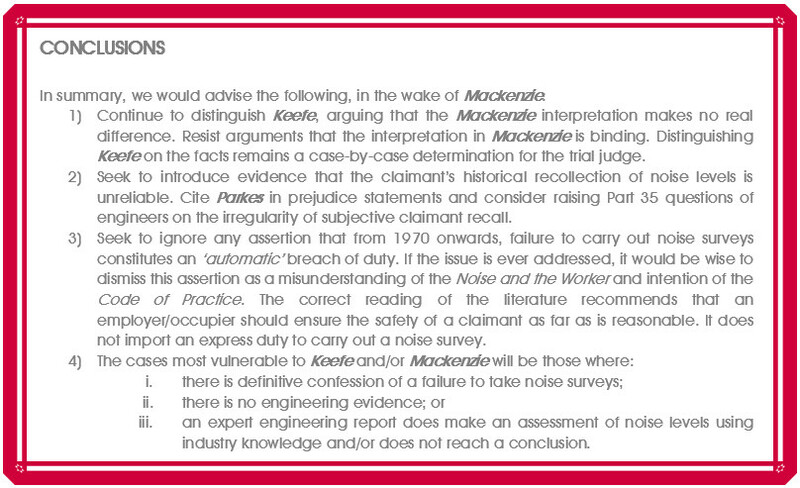 To ward off future danger of the Mackenzie judgment, insurers could benefit from producing their own evidence, which provides a legitimate explanation as to why noise surveys cannot be located, e.g. because the only person who could say whether or not testing was undertaken is now deceased. To rely solely on submissions, as the defendant did in the present case, may be met with risk, in the light of Mackenzie. [i] ‘Christopher Johnson succeeds in High Court industrial disease appeal’ (1 February 2019 Doughty Street Chambers) <https://www.doughtystreet.co.uk/news/christopher-johnson-succeeds-high-court-industrial-disease-appeal> accessed 6 February 2019.